I have n`t trapped at Mynydd Llangyndeyrn since about 2009 or so, though I`ve made several daytime visits. 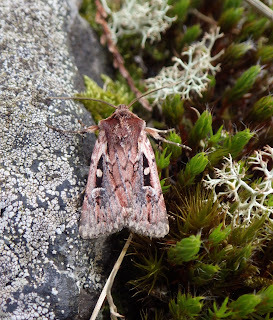 I left out two actinics last night and recorded about 35+ species, the best of which were three heath rustics, with an antler moth, two true lover`s knots and a battered (blame the LYUs!) neglected rustic for `moorland company`. A rusty-dot pearl and a silver y provided a migratory component, but nothing more exciting than that - sadly. Mynydd Llangyndeyrn is located on the high acidic ridge on the NW side of the Gwendraeth Fawr valley, with most of the adjoining Carboniferous limestone band having been quarried away. Another actinic was left at an area of wooded ex-mine shale tips just west of Pontyberem, where a fair mix of late August moths were awaiting me this morning, but nothing of special note. I also had a trap out in the garden at home, but here all the moths were repeats of earlier nights, so I did n`t even jot them down. Above: one of the heath rustics photographed on site at Mynydd Llangyndeyrn.